You'll enjoy this charming and UNIQUE, 3200 Square Foot log cabin home with 3 bedroom + Loft + Bunk Room + 2 convertible beds and 3 bathrooms, located about 10 miles East of Heber City. You'll find yourself surrounded by serene mountainous beauty. This is truly a ONE OF A KIND cabin! The style and decor offsets this cabin from the rest in the area. Ride ATV's and Snowmobiles right from the door! We can hook you up with great deals, just ask. Gather the family together by the cozy wood burning fireplace, or for a movie in the Theater Room with LARGE 100''+ SCREEN with 7.1 Surround Sound! Play a fun game of pool or relax in the HOT TUB on the deck, while soaking in the breathtaking atmosphere. Likely wildlife sightings while you relax. iPod/iPhone streaming available via AirPlay (AppleTV) on the main floor, outside deck, and downstairs. Other amenities include: xbox360 with Rockband, dish net wifi, satellite with full movie channels, Blu-ray players with DVD's, board games for all ages, puzzles, & playing cards. Come experience the gorgeous mountains of Heber City. Book today! Business partners Chris and Ryan built this gem in 2008 as a getaway for their family, friends, and employees. We chose to buy in this location for the perfect summer weather and the peaceful winter days. At 8500 feet you're guaranteed perfect snowmobile conditions. Nestled in the aspens you will have shaded summer days with a perfect view of the pond, wildlife and beautiful sunsets. Near the top of the mountain you're guaranteed to have a quiet and peaceful stay. Near the top of the mountain you will have the opportunity to enjoy an abundance of wildlife. Whether you enjoy watching birds, deer, moose or many other kinds of animals, you won't be disappointed. This rustic mountain cabin allows you to sit in front of the fireplace, read your favorite book and listen to your favorite iPod mix. You can later continue listening to your music as you go out and rest your body in the hot tub as you watch the snow fall or the summer thunder storms roll through. This cabin allows you to relax and enjoy nature whether it's just the two of you, a group of friends or multiple families. DSL - Speeds may vary. Remember this is a cabin in the mountains. A simple collection of books to read. Simple toys for younger kids (3 and younger). Nothing but positive things to say. The owners were extremely accommodating and professional. The location was perfect, as was the cabin. It was better than we hoped for our 3 month stay. Check in and out was a breeze. Great stay! Thank you! We had 10 in our family and stayed in the cabin over the Christmas Holidays. Awesome cabin, very clean, comfortable with everything you need. 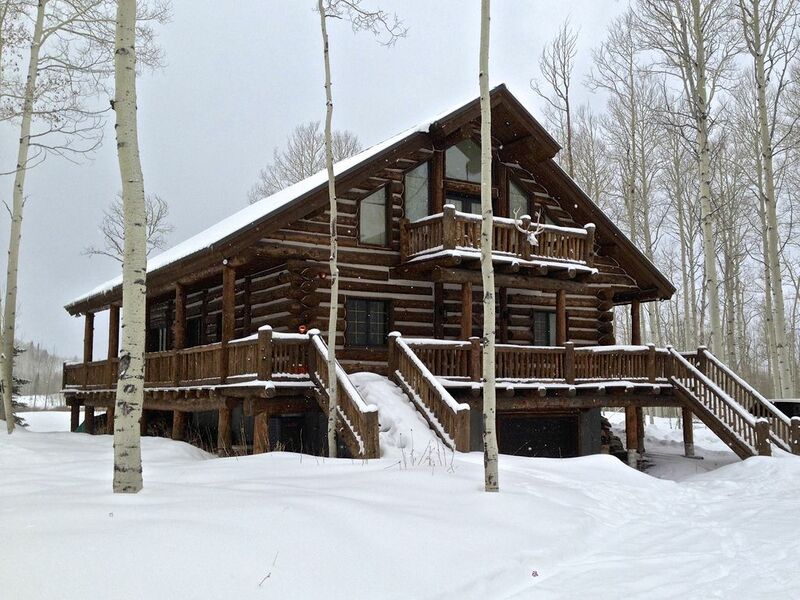 The location is wonderful since it provides a mountain getaway, yet only 20 minutes to Heber and 45 min to the slopes. We rented snowmobiles and were able to enjoy coming and going right from the cabin on our snowmobiles. There are lots and lots of wildness trails to snowmobile from the cabin that our entire family thoroughly enjoyed. Our teenagers and younger ones enjoyed the pool table, big screen TV and the wonderful hot tub on the back deck. Beautiful Mountain views from the large living room windows and off the back deck. It was very comfortable and enjoyable for our whole family to sit and visit with each other in the warmth of the big fireplace. The owners were extremely accommodating and even had a Christmas tree and fireplace mantel all lit and decorated for Christmas for us. We thoroughly enjoyed our stay here and hope to return some day soon! AMAZING Cabin - Perfect for our Getaway! Wow! There are so many great things to say about our rental experience, I'm not sure where to begin! I was very pleased with how well everything was coordinated for us-- the cabin owner was professional and easy to work with. The cabin itself is gorgeous, as well as the location. It felt luxurious, while still maintaining a rustic, mountain feel (which was important to me; if I'm in the mountains, I want to feel comfortable!). We were very pleased with the surrounding nature - the overall feel was very serene. Our group was relatively small, but the cabin could have easily accommodated a larger group-- the kitchen was fully stocked, there were plenty of beds, the common areas were large, etc. One of my favorite elements was the home theater-- enjoying the fire and watching a movie in the theater room was a perfect way to end the day! We are hoping to visit again next year. Thank you for such a great experience. We'll be back! Thank you for the feedback. We are glad you had a good time. I've stayed at this cabin on multiple occasions, and we've always had the wonderful experience we were expecting, and more. The location is just far enough out of town to really feel "in the mountains", but still close enough to take quick excursions to the reservoirs or over to Park City. The property itself is beautiful, with a great, unobstructed view of the mountains. The amenities are top notch, with the hot tub on the back deck being my personal favorite. It really doesn't matter what time of the year you go, there is always so much to do for all members of our family. We've stayed there in the winter, and the snowmobiling and snowshoeing trails were awesome. We've gone back in the summer months bc of its proximity to the lakes and all the great stuff to do down in the valley (plus the ATVs are nice to). Anyways, no doubt we'll be heading back here for the foreseeable future, bc you really can't beat the price for all that your getting. Don't know if you can reply to these posts or not, but let me know if you have any questions and I can give you a 3rd party opinion.